It can be rather impressive to see how much the efficiency of your code can improve as you get to know a platform better. When it comes to writing BlackBerry 10 apps in Cascades my code has gotten dramatically better. This is not the result of any special magic, but instead a by product of putting in the required hours for a given platform. For example my Mileage Tracker app has recently been updated to version 1.5 and despite continuing to add new features in each new version, the size of the .bar file is as small as it has ever been. 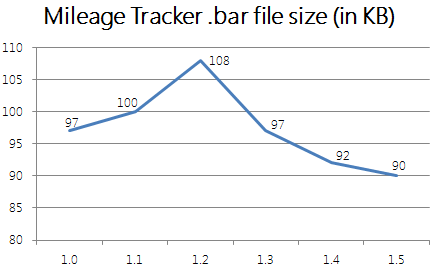 To look at the overall sizes of the .bar file for the Mileage Tracker app see the below chart.